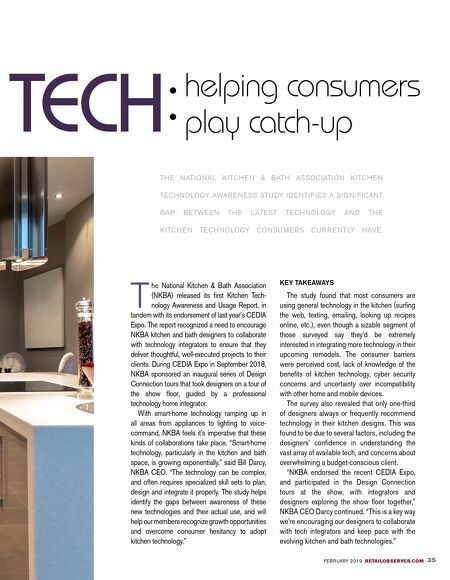 FEBRUARY 2019 RETAILOBSERVER.COM 35 T he National Kitchen & Bath Association (NKBA) released its first Kitchen Tech- nology Awareness and Usage Report, in tandem with its endorsement of last year's CEDIA Expo. 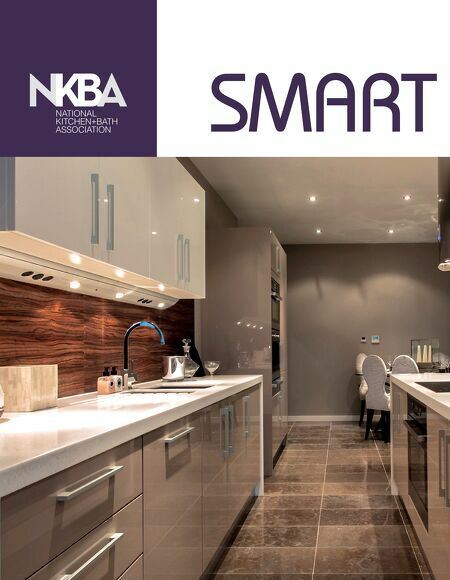 The report recognized a need to encourage NKBA kitchen and bath designers to collaborate with technology integrators to ensure that they deliver thoughtful, well-executed projects to their clients. During CEDIA Expo in September 2018, NKBA sponsored an inaugural series of Design Connection tours that took designers on a tour of the show floor, guided by a professional technology home integrator. With smart-home technology ramping up in all areas from appliances to lighting to voice- command, NKBA feels it's imperative that these kinds of collaborations take place. "Smart-home technology, particularly in the kitchen and bath space, is growing exponentially," said Bill Darcy, NKBA CEO. "The technology can be complex, and often requires specialized skill sets to plan, design and integrate it properly. The study helps identify the gaps between awareness of these new technologies and their actual use, and will help our members recognize growth opportunities and overcome consumer hesitancy to adopt kitchen technology." KEY TAKEAWAYS The study found that most consumers are using general technology in the kitchen (surfing the web, texting, emailing, looking up recipes online, etc. ), even though a sizable segment of those surveyed say they'd be extremely interested in integrating more technology in their upcoming remodels. The consumer barriers were perceived cost, lack of knowledge of the benefits of kitchen technology, cyber security concerns and uncertainty over incompatibility with other home and mobile devices. The survey also revealed that only one-third of designers always or frequently recommend technology in their kitchen designs. This was found to be due to several factors, including the designers' confidence in understanding the vast array of available tech, and concerns about overwhelming a budget-conscious client. "NKBA endorsed the recent CEDIA Expo, and participated in the Design Connection tours at the show, with integrators and designers exploring the show floor together," NKBA CEO Darcy continued. "This is a key way we're encouraging our designers to collaborate with tech integrators and keep pace with the evolving kitchen and bath technologies." helping consumers play catch-up TECH : TH E NATI O NAL K ITC H E N & BATH AS S O C IATI O N K ITC H E N TEC H N O LO GY AWAR E N ES S STU DY I D E NTI F I ES A S I G N I F I CANT GAP B ETWE E N TH E LATEST TEC H N O LO GY AN D TH E K ITC H E N TEC H N O LO GY C O N S U M E R S C U R R E NTLY HAVE.